In Washington, the company has 16 Toys R Us and Babies R Us locations, including four combined stores in Bellevue, Tukwila, Tacoma and Olympia. Toys R Us, the iconic retail chain that has sold toys and games to millions of children for generations, is closing up shop in the United States. The company decided to close or sell its remaining stores after its executives met with creditors throughout the day on Wednesday, according to three people briefed on the discussions. More than 30,000 American jobs are at risk as a result. 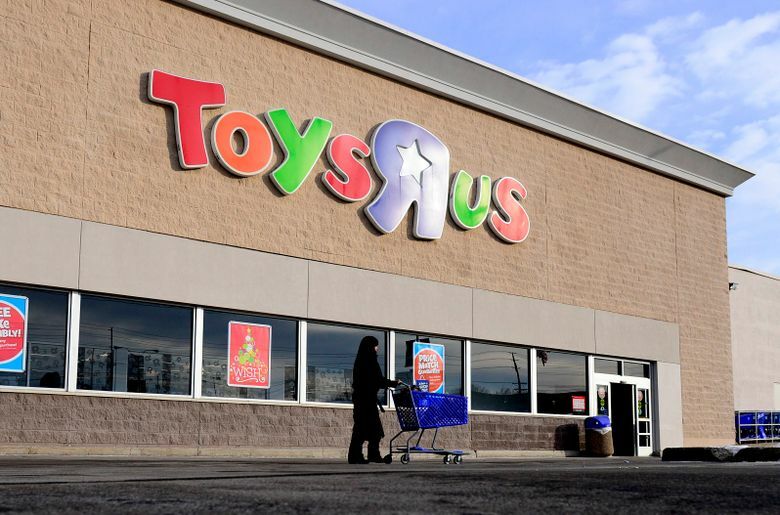 Liquidation sales will take place over the next few months, as the company clears the shelves at its roughly 880 Toys R Us and Babies R Us stores around the country. In September, the private-equity-owned retailer filed for bankruptcy, one of the largest ever in the retail industry. In Washington, the company has 16 Toys R Us and Babies R Us locations, including four combined stores in Bellevue, Tukwila, Tacoma and Olympia. Other Puget Sound locations for Toys R Us are Lynnwood, Marysville, Puyallup and North Bend; the company previously announced the closure of its stores in Spokane, Silverdale and Everett. It is a colossal failure for a company that started out in 1948 as a small store that sold cribs, strollers and other baby items in Washington, D.C. The company expanded to become one of the world’s leading toy retailers, with about 2,000 stores. It was known for its large inventory of toys for every age group and an advertising jingle — “I Don’t Want to Grow Up, I’m a Toys R Us Kid” — that was embedded in the American consumer consciousness. Toys R Us was felled by a combination of too much debt and an antiquated business model that could not keep up with Amazon and Walmart. The company signaled that it was nearing the end Wednesday morning when it said it would shut all its stores in Britain. The global toy industry has been fighting a losing battle for the attention of children obsessed with smartphones and tablets. Global toy sales have been growing slightly each year, but at a slower pace than electronics and video games. In addition, online toy sales have increased by more than 55 percent in the past two years to $17 billion in the United States. After filing for Chapter 11 bankruptcy protection, Toys R Us had planned to shed some of its $5 billion debt load and refresh its operations. But after a languid holiday sales season, the company’s lenders grew worried about whether Toys R Us executives were taking steps drastic enough to restructure the business to allow it to compete over the long term, according to the people briefed on the matter. In recent weeks, the company’s creditors had begun to lose patience with the management and its turnaround efforts, these people said. In January, the company said it was closing 182 unprofitable stores in the United States, and it had already started liquidating those locations. But a total liquidation of its United States operations, the creditors calculated, may allow them to recover more money than keeping the stores open. The company is owned by the private equity firms Bain Capital and Kohlberg Kravis Roberts and the real-estate firm Vornado Realty Trust, which bought the company in 2005. Weighed down by the debt that its owners heaped on the company when they bought it, Toys R Us has not adequately invested in its fading stores and e-commerce operations. Unable to compete with other retailers, Toys R Us has lost market share to better capitalized toy sellers. Toys R Us controlled 13.6 percent of the toy market in the United States in 2016, according to research from IBISWorld. Walmart held 29.4 percent of the market share, Amazon had 16.3 percent and GameStop had 13.9 percent. Seattle Times business reporter Benjamin Romano contributed to this report.